Put A Little Umbrella In Your Drink: Kmart's Big Layaway Giveaway! Have you ever found the perfect item at your favorite store, but then realized it was just the wrong time to buy it? Maybe you wouldn't be paid for another few weeks, or maybe you just needed to save up. This happened to me once with a couch. I have a very odd shaped room and I found the perfect couch for my living room. However, it was the wrong time. When we finally saved up enough to buy it, it was gone! I was so mad! Don't let this happen to you! The holidays are closer than you think. Now is the time to start placing some great Kmart items on free layaway for your family and friends! You can't do that at other major retailers. To make things even sweeter, Kmart is having a Big Layaway Giveaway! Just put your purchases on layaway and every week you have a chance to win in Kmart's Big Layaway Giveaway! It would be so amazing to win! Here is one item I have my eye on. I so want another Digital SLR! 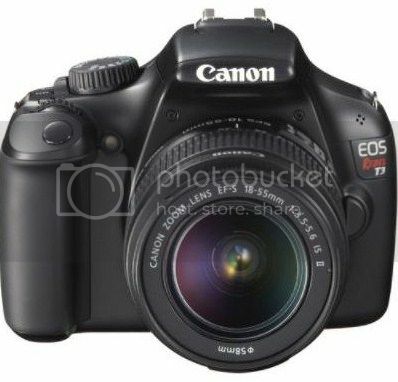 This Canon EOS Rebel would be perfect. What kinds of holiday gifts are you going to put on layaway?! Don't forget to enter to the Big Layaway Giveaway! Happy Shopping!